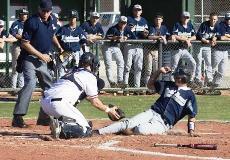 Baseball sliding is often an unappreciated part of the game. Upon close scrutiny, it is revealed there is much more to the skill than just landing on your hip or chest and ending up at the base. As is true with base running, sliding can become a forgotten element in a players total skill arsenol, yet mastery of it is needed to become that complete player everyone strives to be. 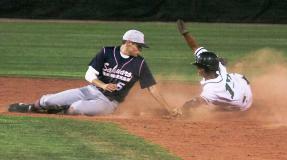 On a close play, the quality of a player's slide may be the difference between out and safe. Figure 4 ~ Bottom leg goes under, bent at 90 degrees, top leg straight out, hands up. 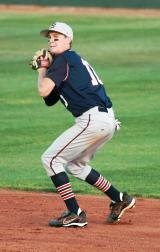 Keep the front foot up, so your cleats do not get stuck in the dirt; but below the defenders knees. Designed to let the runner "pop up" as he contacts the base. The runner in the photo has his hand on the ground. It happens a lot; but keeping the hands in the air is recommended. In this photo, a hook slide would have been a much better slide choice, as the catcher has the plate blocked and the only possible route to the base is outside. Hook slide ~ Bottom leg goes straight, keeping your foot up so your cleats do not get stuck in the dirt; but below the defenders knees. Top leg bends at 90 degrees, as the runner attempts to catch the corner of the base with the toes of his top leg. 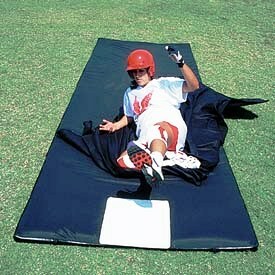 Can also slide by the base, reaching back with either hand, as in the second photo. This puts the runner's body in the most difficult position to be tagged by the defender. Head Or Hands First ~ Similar to a life saving dive into water, the runner leads with both hands in front, sliding on his chest. Keep the fingers up, to avoid injury. As in the photo, if your legs are bent, it creates less drag, allowing more speed into the base. 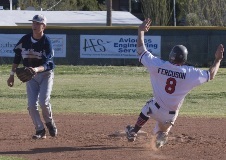 Not a good slide to break up a double play, but very effective for sliding where there may be a tag. Keep both hands up to prevent injury. 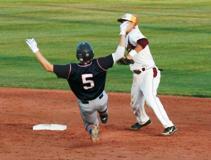 Landing on your sliding side hand can lead to a jammed or broken wrist. Holding a batting glove, or a handful of dirt will help keep those hands up. To determine the direction of your slide, focus in on the fielders position and eyes to see which side the throw may be coming to, then slide away from him. Be decisive and aggressive. Sliding injuries tend to occur when the runner hesitates, is unsure or slides too late. Use figure 4 to break up double play. 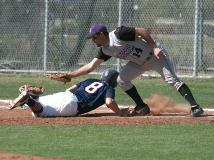 Use head or hands first on pickoff attempt, at all three bases. 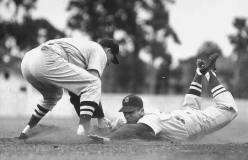 The slide is the same as it is in stealing a base, with the exception that the runner should turn their head to the left, which protects them from being hit with the throw, in the side of the head or face. 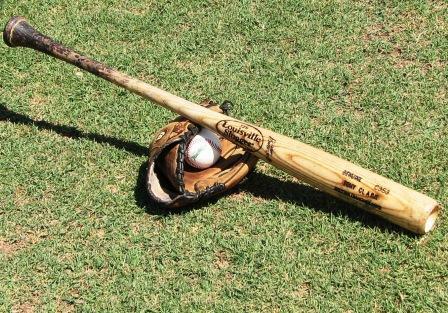 It also provides the ability to look for the over throw, and a quick start to second base, third base or home. Great form, keeping hands high to reduce risk of injury. Have runners practice leads and diving back, while pitchers practice pickoffs. Can also work on stealing bases in the same drill, with or without slides. Use a large cardboard box, flattened. Work on all three slides. Use tennis shoes or socks. If you have really good, green grass, you can slide on that. Use tennis shoes or socks. Commercial sliding mat. 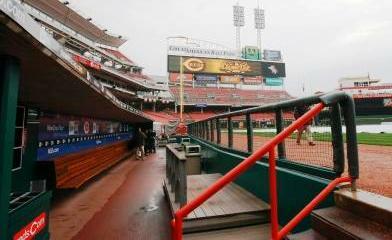 They are quite pricey, but if the cost is shared between baseball and softball, or if a Little League buys one and it rotates between teams, it becomes more cost efficient. They are safe, fun and your players don't develop strawberries that cause them to dislike sliding. Slide in socks or tennies, the mat will last a long time. Slip N Slide. Great for a hot day, change of pace activity, players of all ages love it, and you still are able to work on the skills. Just hook to a hose and you're good to go! Throw in some pizza or hot dogs, they'll follow you anywhere.